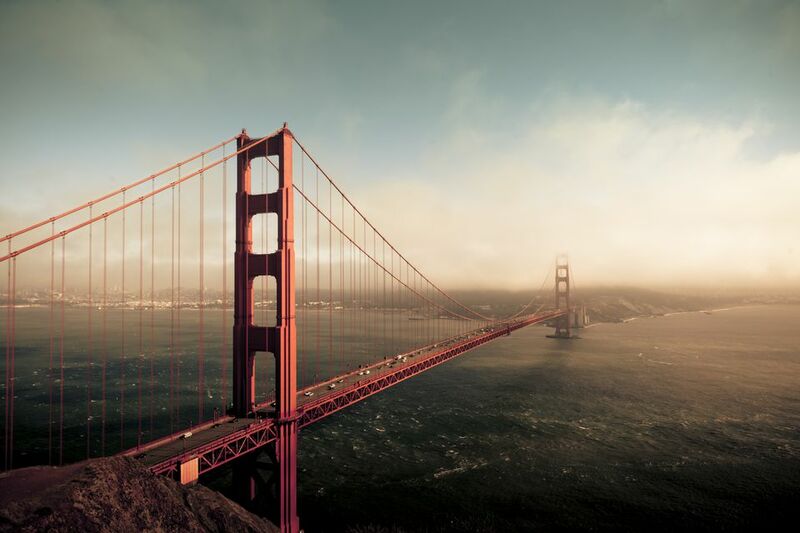 Architecture enthusiasts will fall in love with these top 11 architectural sights in San Francisco. These attractions were selected as finalists in the AIA's America's Favorite Architecture contest. They are listed in order of popularity in their poll. Designed by Swiss architect Mario Botta, SFMOMA is made of squares and circles like ancient buildings, laid on an east/west axis. The geometric look fits especially well in its South of Market neighborhood, where the San Francisco of the 21st Century is still taking shape. The International Terminal at SFO was completed in 2000, designed by architects Skidmore, Owings & Merrill. The wing-shaped structure is the largest base-isolated structure in the world. See It: You won't get past security without a ticket for a flight, but the ticketing area and museum-quality displays are open to the public. If you're going there from San Francisco just to see the place, try using BART. It's not the only suspension bridge in the world, but this one is especially nicely designed and the color and site add to the look. See It: San Francisco City Guides offers guided tours, or just explore on your own. Pedestrians are allowed on the bridge only during daylight hours. One of the great National Park lodges, the Ahwahnee has especially nice public spaces which anyone can visit whether they stay there or not. See It: The lobby and big hall are open to the public and they offer guided tours. Sign up at the concierge desk. Designed in Beaux-Arts style by architect Arthur Brown Jr. and opened in 1915, sports the fifth-largest dome in the world, 14 inches taller than the U. S. Capitol. After a seismic upgrade and renovation completed in 1999, it's a real looker (as they say). See It: San Francisco City Guides offers guided tours once a week. The pointy design actually had a purpose, to allow more light to get down to street level than a conventional, straight-sided building would have. Designed by William L. Pereira & Associates, it has become a San Francisco icon since it opened in 1972. See It: Unfortunately, it has no observation deck, but you can see it from all over town. Under construction when the 1906 earthquake struck San Francisco, the Fairmont fell victim to the firestorm that followed the quake. It opened in 1907 as a symbol of San Francisco's rebirth. Julia Morgan, the first female graduate of Ecole des Beaux Arts in Paris designed the Fairmont, along with Hearst Castle and many other structures in the Bay Area. See It: The lobby and restaurants are open to the public. San Francisco's new baseball stadium enjoys a pretty site with great views and contains many touches that connect it with the great baseball fields of the past. See It: Get a seat for a game or take a behind-the-scenes guided tour. They're given every day, except when there's a day baseball game. Designed by Frank Lloyd Wright before he started the Guggenheim Museum, this small shop (formerly a gift shop) features a spiral ramp and beautiful-but-simple arched brickwork outside the door. See It: No special tours, but the art gallery that occupies the space doesn't mind respectful visitors. The soaring atrium and 17-story hanging gardens are 170 feet high. It has a rotating restaurant on the top floor. It's been used in so many films it's hard to count them all. Designed by architect John Portman, it's a concrete structure that some describe as a "half-twisted Rubik's cube." See It: The lobby (which is its best feature) is open to the public. Sometimes called the "Flintstone House" by locals who gape at it as they pass by on I-280, this 1976 William Nicholson design was formed over inflated aeronautical balloons, which was then covered with a frame of half-inch rebar, a coat of sprayed cement. It's easiest to see from the angle this photo was taken, going north on I-280 and north of Hwy 92.